«Best homemade Hamburger Buns recipe! My very best traditional homemade tulumba recipe for you to recreate these little bites of heaven from scratch! 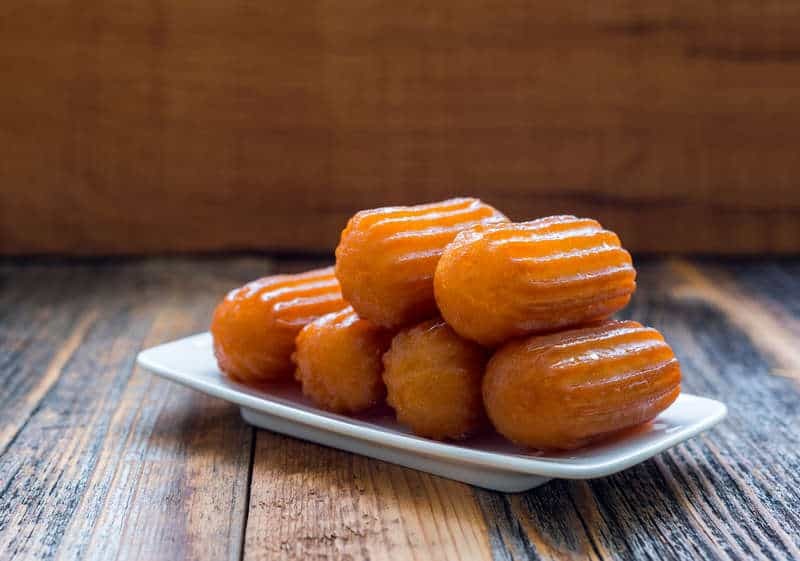 If you have a sweet tooth this mouthwatering extra syrupy bite-sized tulumba recipe is a must try! Tulumba pastries are oblong shaped moist sweet pastries, made from golden and crispy deep-fried dough and then soaked in sweet aromatic syrup.. Simply irresistible! Tulumba is a very popular dessert in Greece. One can find it in almost every patisserie and bakery store! When walking into a Greek bakery I never manage to stop my impulse to buy at least a dozen of these sweet little delights! Tulumba is a dessert originating in the Middle East and later adopted in Greek cuisine. This traditional tulumba recipe from Anatolia is one of the brightest examples of the influence of the Turkish cuisine in lots of popular Greek dishes. Tulumba is one of my personal favorite Greek desserts, so I was more than excited to finally prepare a homemade tulumba recipe for you to try which is equally or even yummier than the ready made, patisserie version. This tulumba recipe is very easy and simple to prepare, but, as always, you have to pay attention to a couple of details to make it to perfection. The preparation of tulumba is similar to that of choux pastry, where the unleavened dough is prepared in a pot over heat, rather than in an electric mixer. The perfect tulumba has a crunchy exterior and a soft, moist interior, which isn’t hollow like the choux pastry as less eggs are used. To prepare this tulumba recipe you will need a pastry bag fitted with a star nozzle to shape the tulumba and some scissors to cut the dough straight into the frying pan. The secret is to deep fry the tulumba over medium heat so it is thoroughly cooked in the middle. Deep fry the tulumba pastries in batches, so that the surface off the pan is comfortably filled but not overwhelmed, otherwise they will probably stick together and will become much less crunchier on the outside. Once you’re done frying them, soak the hot tulumba pastries in the cold syrup and give them ample time to absorb the syrup. So go ahead, give this traditional homemade tulumba recipe a try and indulge yourself to this little sin! To prepare this delicious extra syrupy tulumba recipe, start by making the syrup first. In a small pot add all the ingredients for the syrup and bring to the boil. Let the syrup boil for 4-5 minutes, until the sugar was dissolved and the syrup has slightly thickened. Set aside to cool down completely. Scrape the mixture for the tulumba pasties into a mixer fitted with a paddle attachment and mix at medium speed to cool it. With the mixer running, add the 4 eggs, one at a time, waiting each time for the egg to be absorbed. Stop mixing after each addition to scrape down the sides of the bowl. Mix until the dough is smooth and glossy and the eggs are completely incorporated. The dough should be thick, but should fall slowly and steadily from the beaters when you lift them out of the bowl. Add the vanilla extract and the white vinegar and mix again, until incorporated. Heat the oil for deep frying the tulumba pastries over medium heat. Now it’s time to shape the tulumba pastries. For this tulumba recipe you will need a pasty bag fitted with a large 1cm star nozzle. Place the dough for the tulumba pastries in the pastry bag and squeeze 5cm dough pieces, cutting the dough with wet scissors, into the hot oil. Be careful not to overcrowd the surface of the pan. Fry the tulumba pasties over medium heat, turning them sides and pushing them down into the hot oil, until nicely coloured and cooked through. Remove with a slotted spoon and place on kitchen paper to drain. Transfer the tulumba pastries in the cold syrup and leave them for 2-3 minutes to absorb the syrup. Remove with a slotted spoon and repeat with the rest of the dough. Serve the tulumba pastries cold. Enjoy! Do you have utube videos? Does this only make 10 pieces, or does it make loads but because these are small one person would eat loads? haha! I know what you mean! No it actually makes quite a few, about 20-25 or so of those, depending on how big you make them! Is there a way to make the recipe without a mixer? 🙁 I don’t have one! Ok so where is the wine vinegar and vanilla ectract fitted in?! Where and when are they added?! i just made them .. didnt have whitewine vingaer just regular white vinager. when they where frying some poped. there shape isnt perfect. do you know why that would happen? did i over cook them? or maybe its the fact that i used regular white vinager?